Axel Rocks is great for many reasons, and one of those is its location. A short drive will take you to town or Shell Beach, but you can also stay home all day and take in the ocean view. The sunset views are incredible, and the infinity pool is gorgeous. It’s fully air-conditioned, which is always a plus, and most of the rooms open to the pool terrace. Sunset views, location in Gustavia and AC throughout! Axel Rocks lies on the Gustavia hillside, in an ideal spot for watching the sunset. The four-bedroom villa sits within a large private property just above the sea, with scenic views of the ocean. 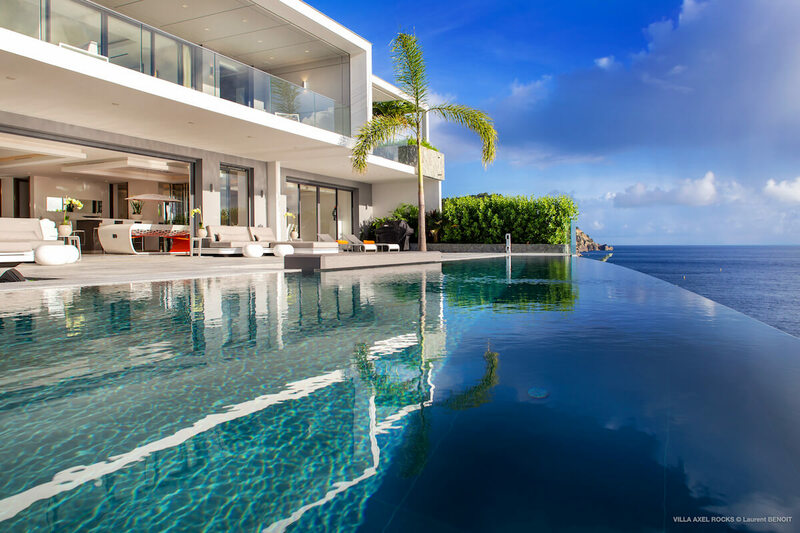 This villa’s heated infinity pool is one of the most stunning aspects of the property. It appears to blend with the sea, and is bordered by a wooden deck. There’s a swim-up pool bar, so guests can take a bottle of Cabernet from the wine cooler and toast to the view. The wide stone terrace has an outdoor dining area and tons of spots to lounge. Inside, Axel Rocks is modern, sleek, and open. The family-style seating area in the living room has enough space for everyone to gather around the fat screen TV, and there’s a chic billiards table in between the living and dining room. A dining table for 10, a breakfast bar, a wine fridge, and ocean views define the dining room, and the modern kitchen features a gas-range stove, large island, and ample counter space. Both of these rooms open to the pool terrace, bringing in the panoramic ocean views. Three of the bedrooms are on the upper level, and one is on the main level. All three of the upper bedrooms have European king-sized beds, ensuite bathrooms, Apple TV, and a private terrace. The bedroom on the lower level opens to the pool terrace and shared spaces, and has a European king-sized bed, Apple TV, and ensuite bathroom. This private, luxurious retreat has a convenient location just minutes from grocery stores and restaurants.